Over Christmas we spent 3 days at Halls Gap in the Geriward mountains (Grampians) in Western Victoria, about 3 hours drive from Melbourne. This is an ancient mountain range where the Aboriginal peoples have lived for about 1,600 generations, yes 40-50,000 years! The Aboriginals were at one with the land, treating it as they would a member of their own family or a close friend. They understood the land, it’s needs, it’s vagaries and the different way it behaved. They also knew that the land was a hard taskmaster that could easily come back and bite them if they didn’t respect it. Bushfires are a constant threat in most parts of Australia. For this reason the Aboriginals used to practice controlled burning in certain areas to prevent larger, out-of-control fires. This practice is still performed by the Victorian Country Fire Authority to this very day. Take the time to plan how we will develop a relationship with a prospect? Take the longer term view? Stay close to our client or prospect and understand their ever changing needs? Position ourselves as trusted long-term advisors? Help our clients in ways that contribute to their business or organisational goals? The Aboriginals knew the importance of taking the longer term view. Indeed, it’s part of their culture. We believe that in business today everything is driven by short term goals. Get more customers / sales; Hit your targets; Achieve short term profitability to get your bonus. These short term goals are often in conflict with effective sales and relationship building and can send mixed messages to your salespeople. Send the message that you’re prepared to ‘buy’ short term business at the expense of medium to long term profitability? Promise your prospects the earth only for them to be let down when they become a customer? 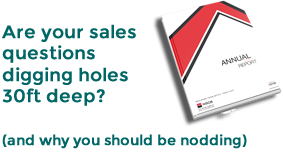 Drive the wrong behaviours of your salespeople to focus on short term goals? The Aboriginals thought long-term for the benefit of their land. Do you do the same for your business?